Most basic physics textbooks describe laser light in fairly simple terms: a beam travels directly from one point to another and, unless it strikes a mirror or other reflective surface, will continue traveling along an arrow-straight path, gradually expanding in size due to the wave nature of light. But these basic rules go out the window with high-intensity laser light. 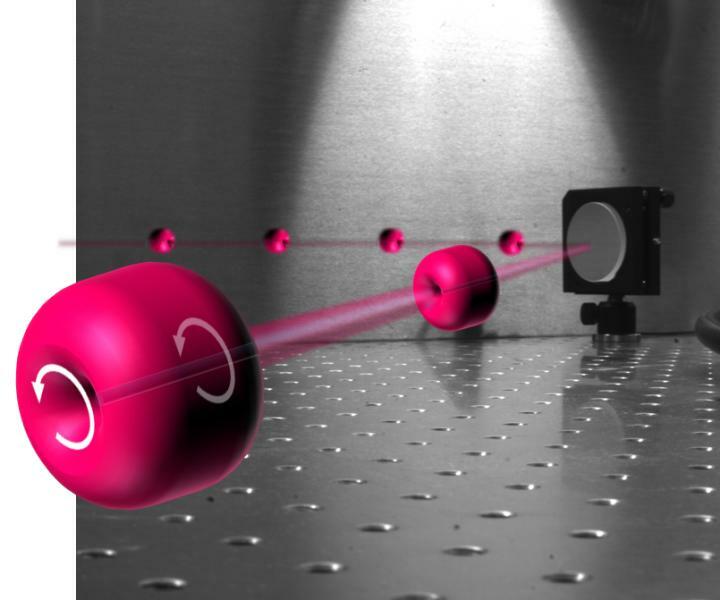 Powerful laser beams, given the right conditions, will act as their own lenses and "self-focus" into a tighter, even more intense beam. 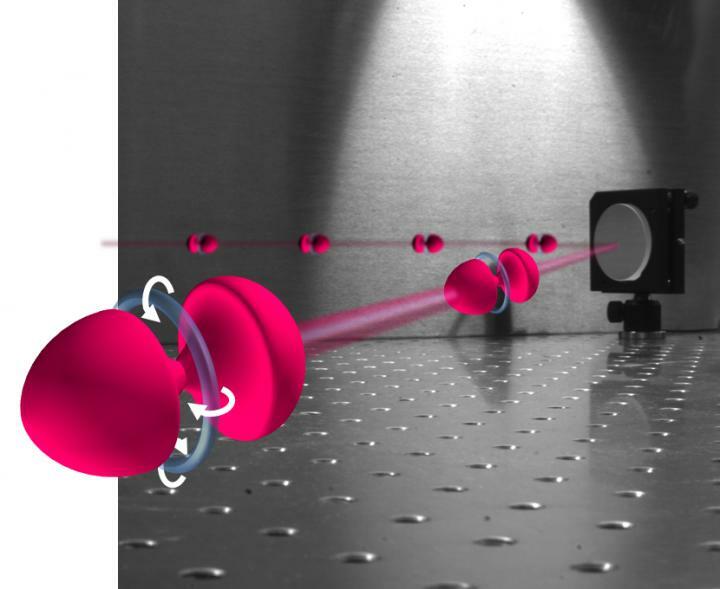 University of Maryland physicists have discovered that these self-focused laser pulses also generate violent swirls of optical energy that strongly resemble smoke rings. In these donut-shaped light structures, known as "spatiotemporal optical vortices," the light energy flows through the inside of the ring and then loops back around the outside. The researchers named the laser smoke rings "spatiotemporal optical vortices," or STOVs. The light structures are ubiquitous and easily created with any powerful laser, given the right conditions. The team strongly suspects that STOVs could explain decades' worth of anomalous results and unexplained effects in the field of high-intensity laser research. "Lasers have been researched for decades, but it turns out that STOVs were under our noses the whole time," said Howard Milchberg, professor of physics and electrical and computer engineering at UMD and senior author of the research paper, who also has an appointment at the UMD Institute for Research in Electronics and Applied Physics (IREAP). "This is a robust, spontaneous feature that's always there. This phenomenon underlies so much that's been done in our field for the past 30-some years." More conventional spatial optical vortices are well-known from prior research--chief among them "orbital angular momentum" (OAM) vortices, where light energy circulates around the beam propagation direction much like water rotates around a drain as it empties from a washbasin. Because these vortices can influence the shape of the central beam, they have proven useful for advanced applications such as high-resolution microscopy. "Conventional optical vortices have been studied since the late 1990s as a way to improve telecommunications, microscopy and other applications. These vortices allow you to control what gets illuminated and what doesn't, by creating small structures in the light itself," said the paper's lead author Nihal Jhajj, a physics graduate student who conducted the research at IREAP. "The smoke ring vortices we discovered may have even broader applications than previously known optical vortices, because they are time dynamic, meaning that they move along with the beam instead of remaining stationary," Jhajj added. "This means that the rings may be useful for manipulating particles moving near the speed of light." "All the evidence we've seen suggests that STOVs are universal," Jhajj said. "Now that we know what to look for, we think that looking at a high-intensity laser pulse propagating through a medium and not seeing STOVs would be a lot like looking at a river and not seeing eddies and currents." "A STOV is not just a spectator to the laser beam, like an angel's halo," explained Milchberg, noting the ability of STOVs to control the central beam's shape and energy flow. "It is more like an electrified angel's halo, with energy shooting back and forth between the halo and the angel's head. We're all very excited to see where this discovery will take us in the future."